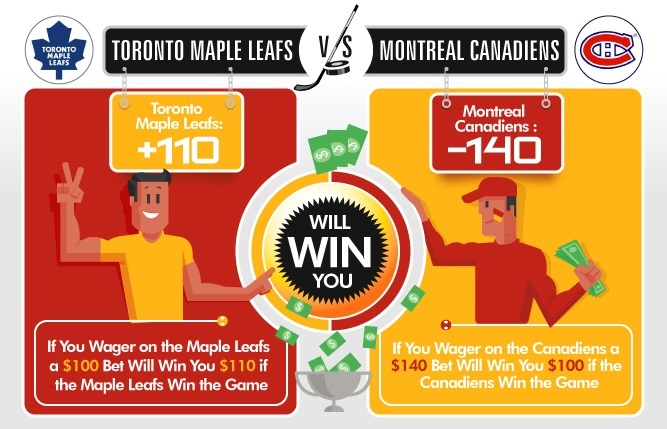 There are a few different ways to bet on hockey, and we will go over them. The one that will be easiest for the general public to understand is the MONEY LINE, which essentially allows the bettor to place a wager on the outright winner of a game, with a price on the favorite and a price on the underdog. You will find these prices expressed in odds that are referred to as “American,” and not fractional. So as the hockey bettor, you are analyzing the “value” that appears in the line on either side, as you perceive it. In this example, which uses something called the “20-cent line,” the home team is listed at the bottom. The team with the minus (-) sign is the favorite, while the team with the plus sign (+) next to it is the underdog. As you can see, the road team is the underdog, which can be rather common in hockey games. If you place a wager on the favored “Team B” you are betting $1.25 for every $1 you hope to win (profit). If you bet on “Team B,” you will profit $1.05 on a winning wager of $1. It is as simple as that. Remember something – since the overtime and shootout process is designed to rid the NHL of tie games, the result by which the money gets returned to all bettors since there is no winner or loser no longer exists. If you are familiar with baseball wagering at all, there is generally not going to be anything foreign to what you have to do to place a hockey money line bet. These bets also exists in the NFL. There is yet another bet in hockey that also exists in baseball, and it is known in this sport as a “PUCK LINE” or a “SPLIT LINE.” What this does is create a combination of a pointspread-type situation and a money line. What it amounts to is that the money line part of it is relative to the puck (or goal) spread. Again, as we mentioned, the home team is on the bottom and the road team is on top. And it has become more or less the standard that the goal “spread’ for this kind of proposition is a goal and a half. Consequently, if you want to wager on the favorite here, that team has to win by at least two goals. If you are on the underdog, they have to either win outright or come to within a single goal for you to win. Obviously in a game like hockey, where there is not a lot of scoring, that is quite a luxury. And you will pay for it, as you can see from the above model, ,where if you want to take the goal and a half you will have to wager $3.20 for every $1 in winnings. On the other side, if you lay the 1.5 goals you are able to take a price. Here you can win $2.60 on a $1 wager.